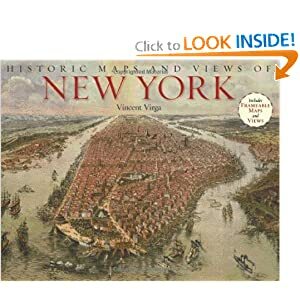 New York Civil War history guest post, plus giveaways! When Charlotte and Alice told their mother they were taking the omnibus down Broadway, they weren’t lying. They just didn’t tell her where they would be getting off. There was simply no time for an argument today. So begins Wedded to War on one of the most famous and historic avenues in the world. In fact, many scenes in Wedded to War are set in locations you can still visit today. 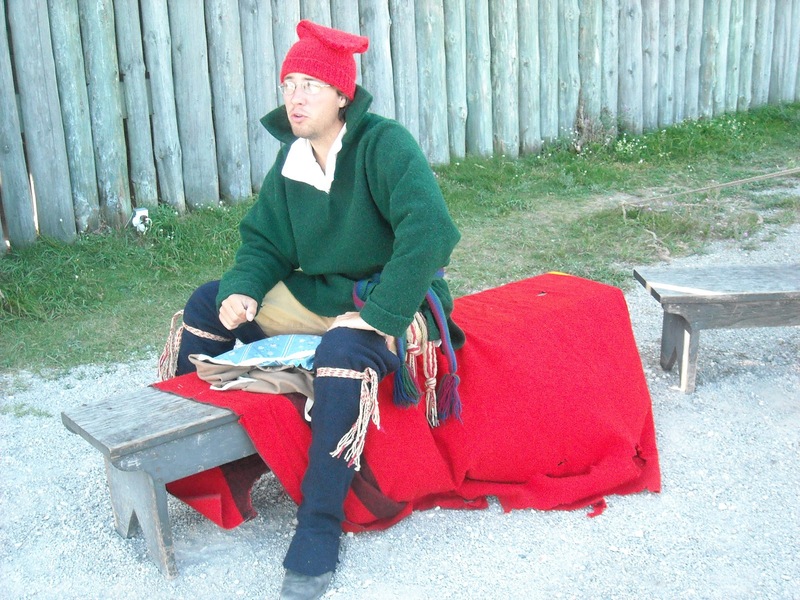 If you love history, this blog post highlighting some of them is for you. (Future blog posts will feature historic sites in Washington and Virginia, the other two “stages” for the dramas in Wedded to War.) 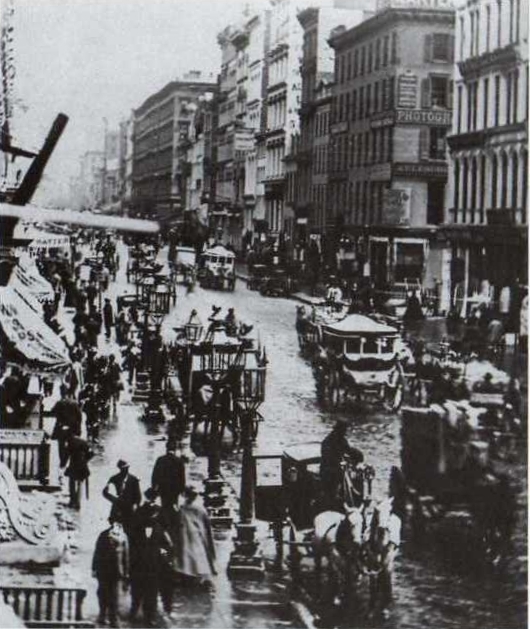 1) Broadway Since the book begins on Broadway, let’s start there on our virtual tour, too. 2) St. Patrick’s Old Cathedral When we first meet the character Ruby O’Flannery, she is outside St. Patrick’s Cathedral on Mott Street, searching the Irish 69th Regiment for a glimpse of her husband Matthew. Here is what that scene may have looked like, below. We also see Ruby revisit the cathedral later in the novel, but stay outside the fence for reasons I will not divulge here. Visitors to New York City can still visit this cathedral, which is now referred to as Old St. Patrick’s, since there is a more recently constructed cathedral by the same name. This is what it looks like today (below). Check out the history of St Patrick's Old Cathedral. Find directions to Old St. Patrick’s. After Ruby’s visit to the cathedral, she returns to her tenement in the 14th Ward. If you’re interested in tenement living, do check out the Lower East Side Tenement Museum. 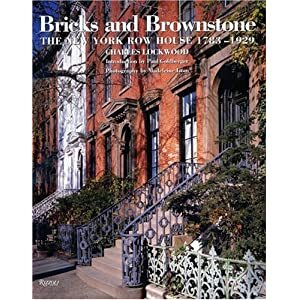 It chronicles the lives of residents over several generations, beginning in 1863, and looks fascinating! If I get back to the city, I will definitely go there myself! Find directions to the Tenement Museum. In order to serve more patients, the building was expanded in 2005, but the original facade of the old Administration Building wasn’t torn down. Instead, it is preserved in a glass atrium. You can see it in the photo below behind the glass front. Now here’s a photo, below, from inside that glass structure. For better photos, including some which showcase the hospital’s impressive Christmas decorating, I highly recommend that you visit this blog post, from a New York movie location scout. He also tells us that inside the main entrance there is a neat exhibit on the hospital, which dates back to the 1700s, and a pamphlet you can take with you. (If you go, will you grab an extra one and mail it to me? Please?) Find maps, parking info and directions here. 4) Cooper Union Charlotte sat on the edge of her chair at the association’s Cooper Union headquarters, spine straight and feet flat on the floor, as if perfect posture even now might have a favorable bearing on her fate. ~Wedded to War Cooper Union was the headquarters of the Women’s Central Association of Relief, which grew into the U.S. Sanitary Commission, so this is where we find Charlotte Waverly in the excerpt above, waiting her turn to be examined by the medical committee about her suitability to become a nurse. 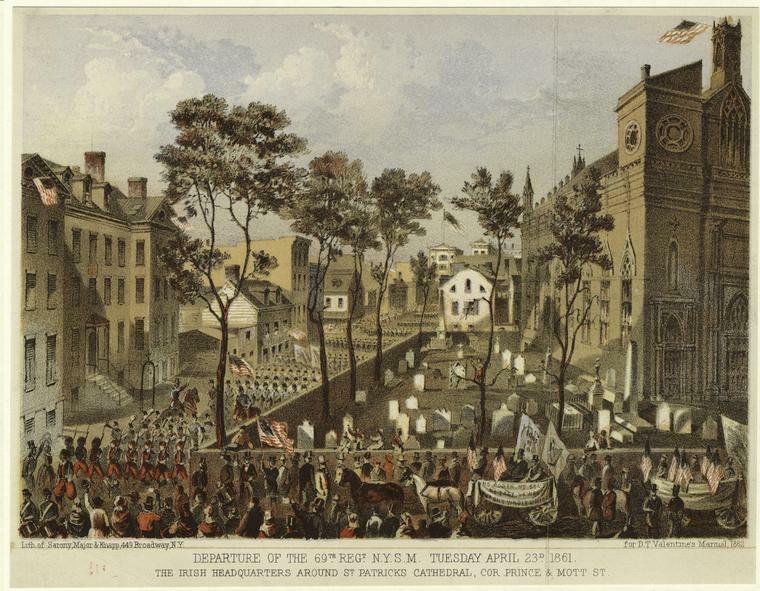 Cooper Union, the tall building on the left in the illustration below, is an extremely historic building. To read more about its significance, visit this web page. The illustration below depicts the first meeting of the Women’s Central Association of Relief inside Cooper Union. More than 4000 of New York City’s women gathered here to organize volunteer efforts to aid the Union army. Out of this meeting, Dr. Elizabeth Blackwell gained support for her idea to train women nurses–a revolutionary idea at the time. What an incredible moment in history! I would have loved to have been there. By the way, Dr. Blackwell’s New York Infirmary for Indigent Women and Children is now New York Downtown Hospital. Not really worth a sightseeing visit, but if you’re interested in the history, check out this bio on Dr. Blackwell. who plays a major role in my novel. Here’s the timeline of the hospital. 5) Central Park Central Park, the first public landscaped park in America, is important in Wedded to War. Completed in the 1850s, it’s Charlotte Waverly’s favorite spot in New York City. Irish immigrant Ruby O’Flannery has a different attitude toward the park since she and her family were evicted from their neighborhood (Seneca Village), a community of African American and immigrant citizens, so the land could be appropriated for Central Park. Landscape architect Frederick Law Olmsted became the executive secretary of the U.S. Sanitary Commission for the first two years of the Civil War, proving his administrative genius and saving thousands of lives. The historical figure Olmsted plays a major role in Wedded to War. Click the image below to see Olmsted’s map of Central Park much larger. The image below is a Currier & Ives hand-colored lithograph called “Central Park, The Drive,” painted in 1862. This is the Central Park scene Charlotte Waverly much preferred over a Broadway promenade. 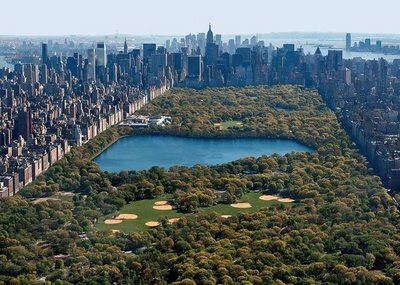 The image below shows Central Park today. Visit the Web site of Central Park, which has maps, events, and other information. 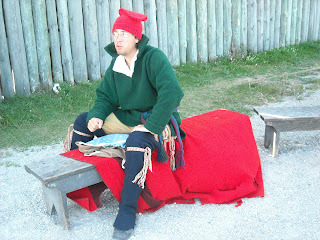 They also have a page to show you the Site of Seneca Village. This concludes the Wedded to War Historic Sites of New York City tour! If I find more, I’ll add them. But my next project will be the Wedded to War Historic Sites of Washington! Wondering what Wedded to War is all about? Click here for an overview and book trailer. Oh, so few books keep you truly guessing until the very last page, and give up their secrets grudgingly one titillating hint at a time. 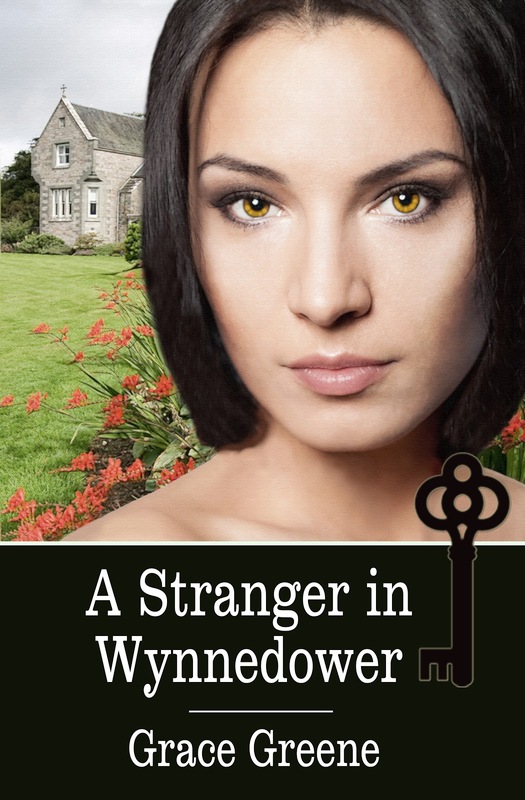 But Laurie Alice Eakes has mastered both intrigue and suspense, dramatic and expertly timed to sweep you to the very heights of anticipation and passion in this thrilling Regency romance. Cassandra Bainbridge is enamored with learning Greek and physics as much as she is enamored with the man she used to know as Geoffrey Giles, the second son of Lord Whittaker. 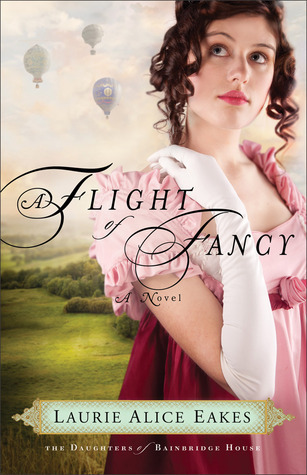 But when Geoffrey inherits the estate unexpectedly, Cassandra's dreams of aeronautic pioneering come under jeopardy since she must assume an uncomfortable societal role as the wife of an Earl. Soon, not just her dreams are threatened, but her very life, as accidents and intrigue surround both her and Whittaker. Set in the backdrop of the Luddite rebellion, as well as the advent of ballooning science, this beautiful and stirring story shimmers with details of a rich history. Each page delivers compelling scenes with characters as fascinating and accessible as the best of Masterpiece Theater, or even Downton Abbey. Themes of seeking forgiveness abound--forgiveness from God, from one another, from an unforgiving society, and even from oneself. Flight of Fancy is a rare story that explores the healing grace of God on scars both internal and external, and the difference between love and lust, all done in a beautifully redemptive and uplifting way. I was left with the renewed conviction that there is no past too corrupted for the Lord to make clean, nor any earnest soul too rebellious for God to restore. If I read this book over and over the rest of my life, I would still be catching the nuance and layers this master storyteller has woven into this superb novel. If ever there was a story that begs for the big screen, it is this. You will not want to miss one savory moment of Flight of Fancy. It will truly take you up from mundane reality and sweep you away! 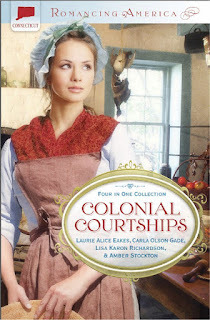 Enter for a chance to win my gently used copy of this charming romance by leaving a comment with your email addy. Winner will be drawn by random.org on Monday Nov 5th at noon. Extra entries for sharing this on twitter and facebook, as well as for following this blog. New England at Christmastime invites a special romance all its own, and this story set in turn of the century Boston captures the imagination and the heart. Characters that fill a literal stage with warmth and endearment, Marceline Murphy and Julie O’Rourke are best friends reunited after several years apart. Right away Julie fills Marcy in on gossip about her brother Sam—Marcy’s schoolgirl crush, and Sam’s handsome and charming best friend Patrick O’Connor. The two are rogues, Southie’s delightful Lotharios. And Marcy vows to stay clear of trouble, until the street-smart and saintly wise Father Fitzgibbons throws them all together as volunteers for the Christmas play. Spending time with both of the devilishly charming young men causes Marcy to second-guess her resolve to avoid romance. Both Sam and Patrick vie for her attention and Marcy wants to believe more than anything that Julie’s brother has turned over a new leaf. She dreams of marrying into her best friend’s big, welcoming family and needs little encouragement to fall head over heels for Sam’s flattery. But she can’t quite put Patrick’s devastating good looks and good-hearted gestures from her mind. Two men claim to love her, but only one can possess her heart. Set amidst a wonderfully realistic parish of Irish families with charitable outreaches and plot twists, secrets, betrayal, and redemption, this story kept drawing me in with each turn of the page. I couldn’t wait to see what would happen not only to the main characters, but also to a cast as rich and warm as Julie Lessman’s writing is imaginative and lively. From little waifs with precocious tongues to grandmothers who bake oven-fresh treats, Ms. Lessman crafts each of her many unique and memorable characters until they become family. But at the center is a hero as unselfish and deserving as ever a Christmas story depicted since that very first hero born in a manger for the sins of the world. I have seldom read a book that exudes all the love, family tradition, and heart-stirring affection that embodies Christmas itself as A Light in the Window beams. This wonderful Christmas romance will warm your holiday season and will stand as a classic for many years to come. Up for grabs are a Kindle Fire, an amazon gift card, and an e-copy of this charming Christmas romance. 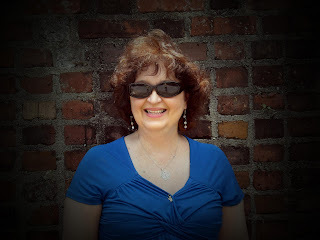 Carrie Fancett Pagels writes “romantic” Christian historical fiction and is represented by Joyce Hart, Hartline Literary Agency. 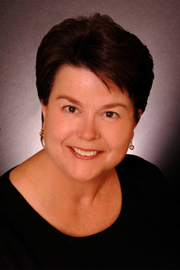 ACFW MidAtlantic Zone Director. 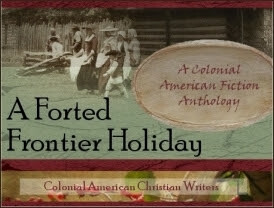 Administrator of the group blog “Colonial Quills” (http://colonialquills.blogspot.com) and international blog “Overcoming Through Time—With God’s Help” (www.carriefancettpagels.com). Recently I realized that I was no longer anyone’s daughter (anyone living) but that I am God’s daughter. That was a weird feeling to know I no longer have that role. A sad feeling. As a resident of Virginia I am blessed to have so much cool historical stuff nearby, including Colonial Williamsburg, Jamestown Settlement, Yorktown Victory Center, Shirley Plantation, and other great sites! I was raised in upper Michigan and am a former Yooper, which has greatly impacted my life. But I was raised by a Kentucky-born mother. And although my father was Yooper born and bred (and you’d be surprised to know that most are NOT the rednecks they are sometimes portrayed as being) my father’s maternal side was from Kentucky, within a short distance of where my mother’s people lived but they didn’t know that until after they wed.
And I want to give a praise here. 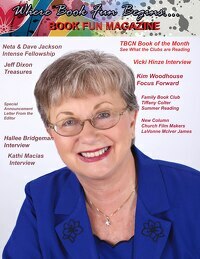 Since I started writing this interview only three weeks ago, I have gone through some things that are resulting in improvement in my arthritis symptoms, praise God! Although some has been really difficult to go through, I am seeing results from where God has taken me and moved me to. A lot of this is in dealing with food and medication allergies. And I am on very little medication for my Rheumatoid arthritis right now, thank you Jesus! And my mobility is greatly improving!!! I have just drawn the winner on random.org and it was #27, which when I calculated all 85 qualified entrants, turns out to be Debbie Lynne Costello! LOL I hope no one thinks there is any collusion going on here. I truly drew her number fair and square. Congratulations, Debbie Lynne! Thank you everybody for visiting as we had such a wonderful week with Carrie. Thank you, Carrie, for being such a wonderfully warm guest and for all the wit and wisdom you brought. Lord bless you dear lady as you connect so many in the CBA with your blogs and reviews and gracious personality. Debbie Lynne is represented by Tamela Hancock Murray of the Steve Laube Agency. She has been mentored by Carol Award Nominee Laurie Alice Eakes and Christy Award Nominee MaryLu Tyndall. To hone her craft she has worked with a private editor. She is an active member of ACFW. 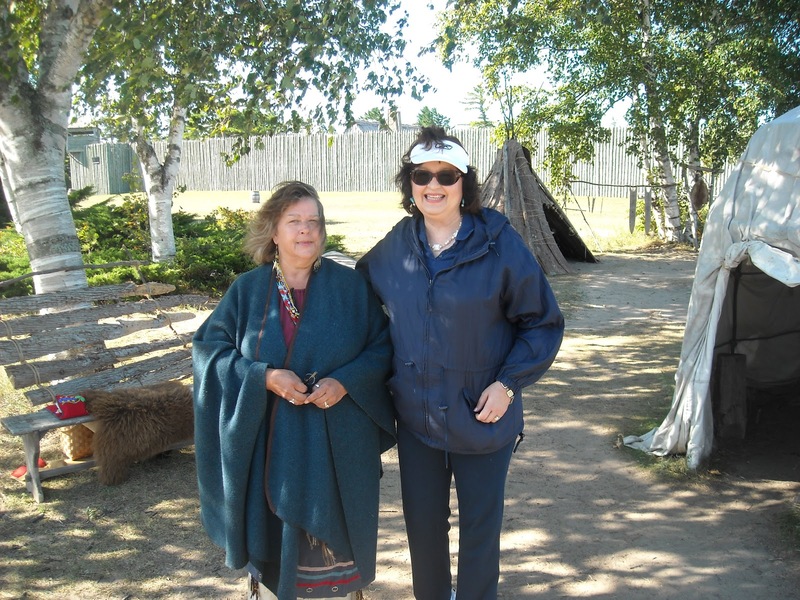 She co-founded CROWN Marketing which promotes CBA historicals. Debbie Lynne has two websites and two blogs and works actively on building her platform. She and her husband live in South Carolina with their shelites and near their four children. 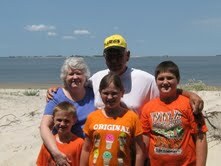 They often vacation in the Charleston area where her stories are set. LOL! I love my hot tea in the morning. I admit, I’m addicted to my Lipton. I drink a ton of water. Enough that my hubby put an RO unit in our kitchen. Love sweet tea and it loves my hips so I only drink it when we go out to eat. That’s a tough question. I started writing stories when I was in about second grade. And to go off on a rabbit trail, my mother saved those stories and gave them to me about a year ago. What an awesome surprise! But back to the question. I took every creative writing class I could in high school, and in college I studied journalism. So I knew I wanted to write as far back as then. But to be a fiction writer? I’m going to say about 5 years ago when my husband told me I should write a book and I did. Q: If there were a writing fairy, and you captured her and fed her chocolate coconut cookies until she granted you three wishes, what would those wishes be? Q: How do your roles of mother, wife, cheerleader, patriot, daughter of Christ, resident of (SC) etc. play into your writing? OMGoodness girlfriend! Are you wanting a book? Lol. 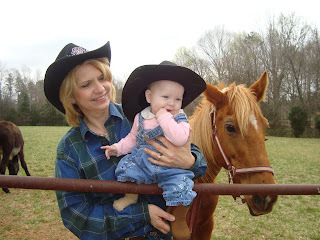 I’ve learned a lot from being a mother and wife and many of those lessons find their way into my stories. As you know I am a fanatical patriot. I love my country and even though it has many problems it’s still the greatest nation in the world to live in my opinion. So I hope my love for my country shines through by the research I do into its history. Cheerleader and daughter of Christ—is the reason I write. In hope to touch someone’s life when they need it most. I want my work to have purpose, not just entertainment. Though, I do want to entertain, too. Lastly, resident of SC. Most of my stories thus far are set in SC and the one that isn’t, is right next door in Savannah. I love Charleston, South Carolina and I believe it shows in my stories. Q: What do you hope your readers will take away from their time and investment in your stories? I try to write stories of real people with real problems. I hope that my story will resonate truth with some readers when they travel through a similar valley that one of my characters has recently taken. And I hope that regardless they will take away something that strengthens their faith in the Lord and help them trust in the promises He’s given us. I’d say Jesus but I’m afraid I’d be speechless with my face buried in the sand. So I think I would say David. I’d love to ask him why God said that he (David) was a man after His (God) own heart. I’d love to know David’s secret. He obviously had many weaknesses to sin. What was it that David had that others in the bible didn’t? MaryLu Tyndall was my first mentor. She took the time to tell me what I needed to do as I tried to learn the ropes. She was and is a huge blessing to me, answering my questions, praying for me, and encouraging me. Today she is one of the dearest friends. Laurie Alice Eakes was my next mentor. She helped me so much with my writing. Showed me my weakness and helped me become stronger in those areas. She too has become a very dear friend. God is so good! I’ve made some of the best friends in my life since I’ve started writing. Q: In the spirit of paying that mentorship forward, do you have any advice for the beginning writer? Read some good books on writing. Ask questions to knowledgeable authors. Be tough! This business isn’t for sissies. You have to have tough skin and be able to take criticism. And lastly, be patient and don’t give up. There are some stories of writers who get published on their first story, but that’s rare. If you don’t get an agent or contract on your first story don’t quit. Listen to what you’re being told and work to fix the problems and keep writing. Chin up! Debbie Lynne has graciously offered to do a beautiful basket giveaway for our readers this week. 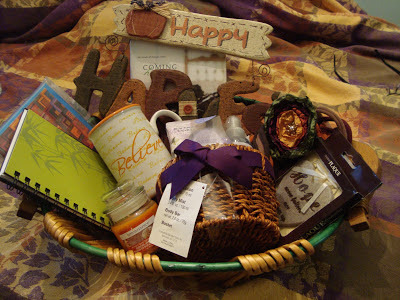 The basket has a pumpkin candle, bath basket with soap, lotion and spray, journal, stationary, HOPE plaque, autumn "believe" mug, "Happy Harvest" hanging, a fall flower necklace, and the book Coming Home by Stacy Hawkins Adams. I am doing a second giveaway for another lucky commenter--two of Debbie Lynne's favorites--a Lindt chocolate candy bar and a small box of Lipton Bedtime Story Tea, plus an autumn mug. Perfect for your reading getaway! We have two winners!! Melanie Dickerson, you have won Debbie Lynne's fabulous fall basket. 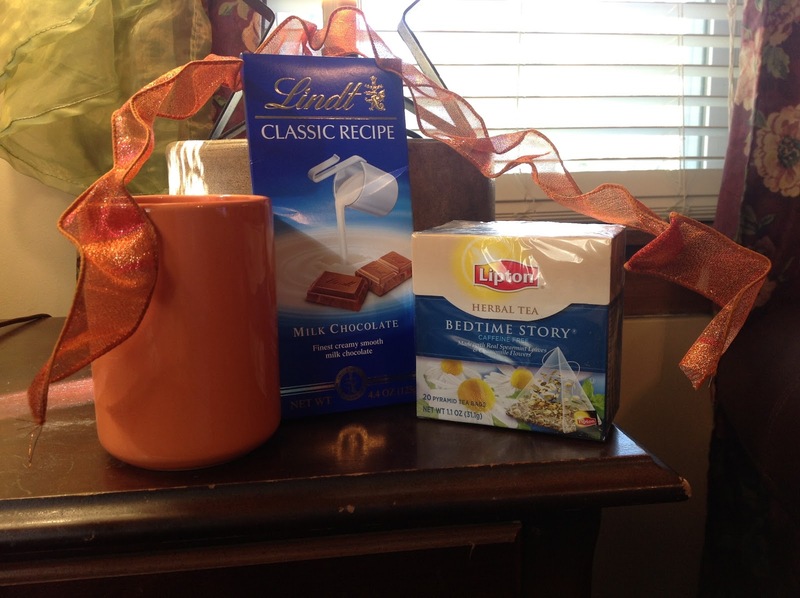 And Teddy, you have won the tea, chocolate and fall mug. I will send emails shortly! Congratulations, ladies, and thank you to everyone who came and made this such a wonderful week. Blessings! Seldom have I been so immersed in a story world. I am so thankful this was not a quick read for me. It was long, luxuriant, and utterly consuming. My pool deck, my bedroom, the doctor's office, and every spare minute in the car turned into the Kentucky wilderness this summer. I experienced Roxanna Rowan's vulnerability to heartache, imminent Indian attack, a Spartan existence within the stockade walls of a military fort, but most alarming of all, the dangerous charms of Colonel Cassius Clayton McLinn. McLinn is a man among men, redoubtable in stature, in reputation, in authority, and in making Roxie's sensible heart betray her. The daughter of a soldier, she proves herself as determined and formidable as he in a contest of wills and of romance. from darkness and despairing circumstance. This is a book that almost defies genre, because it is so much more than a romance, though the romance itself pulled at my heart so relentlessly I could never go long without turning another page. Heart-achingly beautiful and sorrowful and so full of longing, the hero and heroine move beyond sympathetic to saturating, engaging the reader's highest hopes and deepest longings. And yet, this is a story of the power of hope itself. Hope in God. Hope in the future. Hope in the better angels of our nature. And for me, hope that more novels of this caliber will continue to flow from a master storyteller like Ms. Frantz. 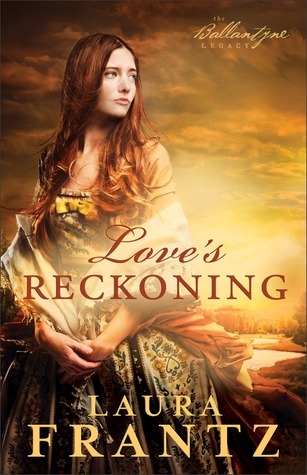 In fact, Laura has a new one out--Love's Reckoning--which promises to be as good or better. One blog post will never be able to tell the story of this innovative and venerable institution. Let this serve as an introduction to an immense topic, and establish the distinction of Elmira's role in pioneering education for women. I’ve just read a fantastic book published in 1955 on Elmira College’s centennial called Elmira College: The first 100 years by E. Charles Barber. Written in an engaging and at times almost deadpan humorous way, it chronicles this historic institution which was the very first to offer women a baccalaureate degree equal to that of a man. Although Oberlin offered women a baccalaureate in 1837, the difference lies in the academic rigors which Elmira demanded of its female students. From 1855 Elmira offered two courses of study, classical and scientific. In the classical curriculum, a young lady would have studied Greek and Latin, and in the scientific course, only Latin. Both would include mathematics, rhetoric, English literature, philosophy, history and the natural sciences such as botany and astronomy. Add to that optional courses in music and studio art, as well as modern languages. Vassar, often cited as another first to offer women a man’s degree, didn’t open until a full decade after Elmira in 1865, and in fact, according to Barber, drew much if its curriculum from Elmira’s. They shared a professor, Charles S. Farrar, who also served as chief architect of the original building in Elmira, Cowles Hall, as well as an observatory which came shortly after. A clear connection exists in the exchanging of ideas between Elmira and Vassar. The chief difference seems to be that Vassar’s patron and namesake funded it far more lavishly than Elmira’s founder Simeon Benjamin could, and therefore earned Vassar greater notoriety. Filled with amusing and poignant anecdotes and biographies, Barber’s book brings to life the early college and early Elmira itself. A canal and rail town, Elmira boasted connections, commerce, and culture, but also transient laborers and their seamy amusements. The dual nature of the town demanded a delicate balance for its fair student body, which was achieved under the artful direction of its first president Dr. Augustus Cowles. Over 280 pages, this book pays homage to the times in the mid 19th century when progressive ideas fought their way through a white-dominated, patriarchal society, but makes a point that “enlightened” modern historians fail to notice. These progressive ideals were championed by men of deep Christian faith, soft-spoken men of great educations and fine minds who believed deeply in causes such as abolition and equal educational opportunities for women. Here the Victorian standards of modesty and charity for women are treated without the disdain of modern viewpoint. This experiment on Prospect Hill in a burgeoning mid-nineteenth century New York rail town proved once and for all that women were capable of great intellectual accomplishment. For women everywhere, Elmira has become a light to the world, a city set on a hill whose light cannot be hidden. I am giving away my gently used copy of this fabulous Civil War novel to a random name draw. Leave a comment with your name and email addy. Contest ends Wednesday Sept 26th. Jocelyn Green is on my figurative dart board. She has written the consummate portrait of a Civil War nurse, and that riles me, as a long-time student and writer of Civil War era fiction. Her attention to detail and stellar research truly saturate each page of this story. Her debut fiction novel is based on the diary of Georgeanna Woolsey, a young lady of privilege from Manhattan who leaves behind her posh salons and world-class dining and theater to forge the way for women to serve the war effort. So my first dart aimed at this author is, I admit, aimed in pure jealousy, because I long to write with that level of immersion. But the next dart I aimed, instead of jealousy, is all admiration. She has set the bar high, and I aim to meet it. Her heroine Charlotte Waverly has all the pluck necessary to not only leave her pampered life behind, but to take on the most odious work for the Union Sanitary Commission, all under intense persecution from men who view women like her as interlopers, inept and easily dismissed. the background story of love interests, courtship, social and gender prejudices, and of course epic war, keep the tension sizzling on every page. My dart arsenal fires again for the romance thread--a dead bullseye. 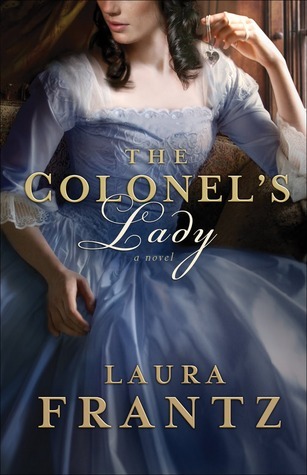 She creates a wonderful hero in Caleb Lansing, Charlotte's long-time friend who now serves as a Federal army surgeon. Though we don't get to see him much due to Charlotte's engrossing story and a full cast of characters and subplots, Caleb's presence is felt throughout. He is the one she longs for, the one who represents comfort and goodness and the pursuit of her dreams. 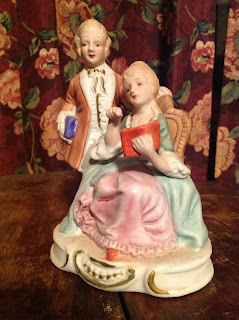 His acceptance and encouragement of her avocation in a world dominated by men makes him truly heroic--the reader will keep going to the very end to see how they overcome courtship rivalry, war logistics, sickness, and their own insecurities to find their happily ever after. And finally, one last dart aimed at Ms. Green's way of making each character three dimensional and sympathetic--even the antagonistic Mr. Phineas Hastings. I loved her treatment of the Irish immigrant, Ruby, whose husband serves in the NY "Fighting" 69th. Since my own great grandfather John Cronin served in the 69th it held personal interest to me. Glimpses into Frederick Law Olmsted, the head of the Sanitary Commission, and also the hospital chaplain Edward Goodrich add dimension to the story. This really is a must read for any student of the Civil War, of women's rights, and of the advent of modern medicine. Meticulously researched and engaging, Wedded to War hits the mark on every score. CONGRATULATIONS, Jes, your name has been drawn by random.org generator to win our giveaway! I will be emailing you shortly. Did I say chemistry? Oh, mercy, does this book cook on a Bunson burner of romance and suspense! Meredith has loved Travis Archer since she was a child, rescued by his gallantry after schoolyard bullies caused her a mishap on Archer land. A decade later, she must come to his rescue when a wicked man's ambition puts the Archers in the crosshairs. Her unchaperoned arrival would compromise her reputation unless one of the bachelor brothers agrees to marry her. The Archer men draw straws for her hand, and the rest of the story explodes off the page with color, effervescence and sizzle you won't want to miss! 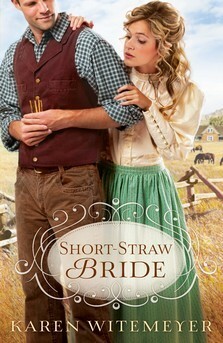 Passion abounds in Texas between a rugged rancher and one feisty girl. Travis must learn to release the death grip he holds on everything under his control. Behind his uber-masculine facade beats a deliciously vulnerable heart, one that the reader will latch onto with the same tight hold. Meri longs to believe that she is desirable and not merely a responsibility. The emotion and tension simmer until that last satisfying page turn. This is the best book yet by a very gifted writer, Karen Witemeyer. Still holding my smelling salts close after swooning hard for this one! I have read all of Karen's books, and this is my favorite so far. She holds a Masters degree in Psychology, and it really shows in the depth of her characterization. I really wanted to keep my influencer copy, but then I decided this story is so good, someone else deserves a chance to read it. I am giving my gently used copy away to one random commenter, to be chosen on Monday, July 16th. Please be sure to leave your email addy with your comment so I can contact the winner.